As you might imagine, Zoulah is getting very excited for the big day. Only four more days until Halloween! At her "Bewitchen Kitchen" she stirred up some Hot and Spicy Peanut Brittle, and she can't keep her little green hands off of it! 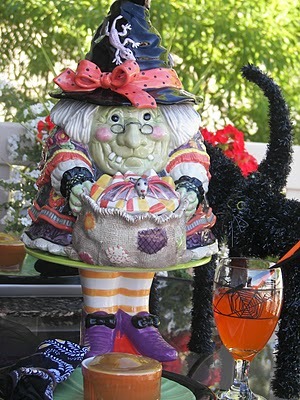 You are going to love this little witch for this recipe she came up with. It all started with Martha....yes, you know Martha, as in Stewart. About 15 years ago during the month of October, we had just sold our home in California, and we moved in with my husband's Uncle Bill for a couple of weeks until we could find an apartment. Bill and I used to watch the Martha Stewart Show together. That Halloween, on one of Martha's shows, she made peanut brittle. I went out an bought a nice Taylor thermometer so that I could use it to make peanut brittle. With my dandy new thermometer in hand, the first batch burned. Undaunted, I tried again, and the second batch burned. Determined to be successful, I tried for a third time and ditched the thermometer and used the old-fashioned "water" method and I had success!! I returned the $15 thermometer never thinking it could be my error! Since then I have learned that you have to calibrate your thermometer. So Zoulah and I decided to make some peanut brittle for my husband. Zoulah, the spicy witch that she is decided to change it up a bit with some Hot and Spicy peanuts, crunchy coated, that she found at Wal-Mart! Lightly spread butter on large baking pan and set aside. Place sugar, light corn syrup, and water in a medium sized, heavy, saucepan. Cook over medium heat to the soft ball stage (around 234 to 240 degrees). Add peanuts and salt. Then cook to hard-crack stage (around 300 to 310 degrees). Stir in butter, baking soda, and vanilla. Quickly pour onto buttered baking pan. Spread out a little bit. When cool and hard, break into pieces. Peanut brittle ready to mail to my husband. Many peanut brittle recipes direct you to pull the edges of the peanut brittle so that you can thin it. Zoulah likes thick peanut brittle so she skips this step. To calibrate your thermometer, put some water in a sauce pan with your thermometer. Bring the water to a boil. When the water comes to a boil, note what temperature your thermometer indicates, then adjust accordingly. For example, if water is boiling and your thermometer reads at 200, then adjust your candy cooking temperatures down 12 degrees. We live at 5700 feet above sea level, and water boils at about 200 degrees. You generally subtract a degree for every 500 feet above sea level. We love peanut brittle but I've never made it, being somewhat nervous about making candy. You make it sound very easy - and it looks yummy. I loved Martha back then..now too but never see her..I made VCR tapes years ago..my mentor back then.. Your brittle looks delicious.Thanks for the calibrating tip..never knew..
Oh goodness, Joni, this sounds totally different and delicious. Perfect for Halloween too! Sometimes the old methods are the best, color, texture, etc. Love peanut brittle but have never made it! We love peanut brittle. I love the spice. Hubby will love getting this treat from you and Zoulah!